PITTSBURGH — After losing their last three, the Robert Morris men’s hockey team (9-16-1, 8-11-1 AHA) looks to get back in the win column as they face the Sacred Heart Pioneers (8-13-3, 7-9-2 AHA) this weekend. Earlier this year, the series between the two teams in Bridgeport was split; both teams winning a contest 2-1. Daniel Mantenuto and Alex Tonge both had two points on the weekend for the Colonials. Last week, the Colonials traveled to Colorado Springs, Colorado to take on the number two team in the AHA, the Air Force Falcons (13-9-4, 11-6-3 AHA). 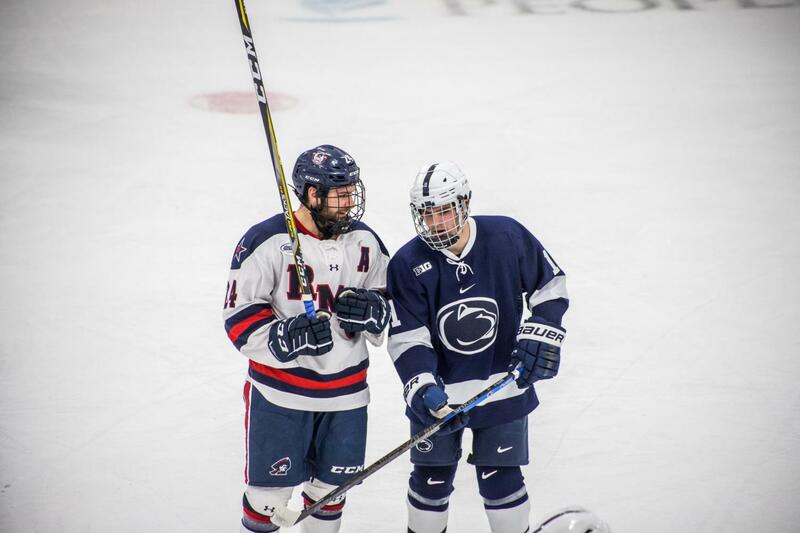 Robert Morris was swept in the series, losing both games by a 3-1 tally. In the first game, Jacob Coleman was the only Colonial to find the back of the net, while Alex Tonge scored the lone goal for the Colonials in game two. Francis Marotte made a total of 49 saves on 55 shots on the weekend. One place the Colonials have struggled as of late is their discipline. Robert Morris currently owns the highest penalties per game in the Atlantic Hockey with 5.69. An area where the Colonials have succeeded, however, is in the face off dot. The Colonials are second in the AHA, with a .528 winning percentage, only behind Air Force. In Sacred Heart’s last series, they hosted the last place Crusaders of Holy Cross (5-16-3, 5-11-2 AHA). The Pioneers won the first game 5-2, with Ryan Steele, Mike Lee, Austin Magera, Vito Bavaro and Nick Boyagian each finding the back of the net. However, in game two, Sacred Heart would drop the contest 4-1, with Mark Johnstone scoring the goal, and Ryan Benson making 16 saves in the loss. One thing Sacred Heart knows how to do is put pucks on the net, as the Pioneers lead the AHA with 737 shots, which is 38 more than Robert Morris. Another strong suit of the Pioneers is their penalty kill, which is currently top 20 in the NCAA, operating at a .854. Daniel Mantenuto (RMU): The junior from Thornhill, Ontario has 10 points (3g, 7a) on the year, and the last time Robert Morris and Sacred Heart faced, he had two assists on the weekend. Mantenuto is also operating at a career-high shooting percentage, a .094. Francis Marotte (RMU): Marrotte, a junior from Longueuil, Quebec, is currently tied with Christian Boucher for second most wins in program history and is only one win behind Terry Shafer for 43, which is the most all-time. Statistically, Marrotte is having his worst season with a .901 save percentage and 3.11 goals against average. However, Marrotte has played well against the Pioneers in the past, only allowing seven goals in six career games. Austin Magera (SHU): Magera, only a freshman, currently leads the Pioneers with 16 points (6g, 10a) in 24 games. Magera has proven to come up clutch for Sacred Heart, with four game-winning goals. Matt Tugnutt (SHU): As the son of former NHL goaltender Ron Tugnutt, one would expect Matt to make his home in between the pipes. However, Tugnutt is a shooter for the Pioneers, with 12 points (6g, 6a) on the year. He is second on the team with 62 shots. Although the Colonials need these wins in order to stay competitive in the AHA (Robert Morris currently sits tied for sixth), this game will play out similarly to the previous series between these two. Robert Morris will win the first game 2-0, with Marrotte tying Terry Shafer for most wins in program history with 43. Daniel Mantenuto gets an assist in the shutout. In game two of the series, Sacred Heart will respond, winning a close overtime game 3-2. Matt Tugnutt scores the game-winner for the Pioneers.